Our Abpromise guarantee covers the use of ab2318 in the following tested applications. Prostaglandin E2 (PGE2) is an extensively studied prostaglandin owing to its predominance in inflammation, cancer, atherosclerosis, autoimmune disease, and sepsis. Publishing research using ab2318? Please let us know so that we can cite the reference in this datasheet. I am interested in neutralizing human PGE2 in in vitro cultures, and I'm having troubles finding a suitable antibody for this.On your website, I have found some anti-PGE2 antibodies that react with human PGE2, but neutralization in cultures is not listed as a recommended application. I have also found this issue addressed in one of your scientific support FAQs to the antibody with the catalogue number 'ab2318' but the answer was not very conclusive (you do not recommed use of any of these antibodies in culture due to the presenc of sodium azide, but I could find no follow-up entries as to whether the sodium azide can be successfully removed). Since this entry dates back to 2006, I was wondering whether you have since made any more experience with these PGE2 antibodies, or whether you have any new products that I could use for my human in vitro neutralization studies. 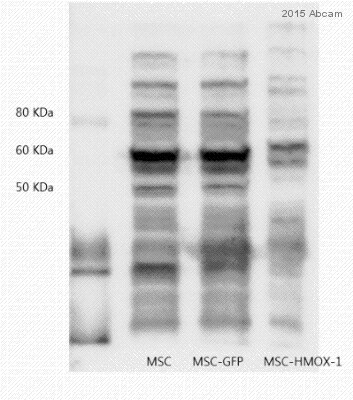 Thank you very much for your interest in ab2318 Anti-Prostaglandin E2 antibody. https://www.abcam.com/index.html?datasheet=109208 (or use the following: https://www.abcam.com/index.html?datasheet=109208). As the application hasn't been tested, I can offer a discount off a future purchase if you buy ab2318 now, test it in cell culture assay and submit feedback to us in the form of an Abreview. It doesn’t matter whether the Abreview is positive or negative, we would just really like to receive your feedback. The discount would be to the value of 1 free primary antibody. 1. Reply to this e-mail to let me know that you would like to proceed and test ab2318 in cell culture assay. I will then send a discount code. This code must be issued before purchasing ab2318 so please wait for my reply before ordering. 2. Purchase ab2318 either by phone, fax, or online (www.abcam.com). 3. Test it in cell culture assay. We are always pleased to obtain feedback about our products and any information is greatly appreciated! Even if ab2318 turns out to be unsuitable for cell culture assay, you will still receive the discount on your next purchase after your Abreview has been submitted. Does it only recognize PGE2? How about PEG2 metabolite like 13,14-dihydro-15-keto PGE2.? Unfortunately, we do not have information regarding cross reactivity of ab2318 to a PEG2 metabolite like 13,14-dihydro-15-keto PGE2. I am very pleased to hear you would like to accept our offer and test ab2318 in IP. This code will give you 100% off your next order before the expiration date. To redeem this offer, please submit an Abreview for IP and include this code in the “Additional Comments” section so we know the Abreview is for this promotion. Please remember that submission of the Abreview is sufficient for the discount code to become active. 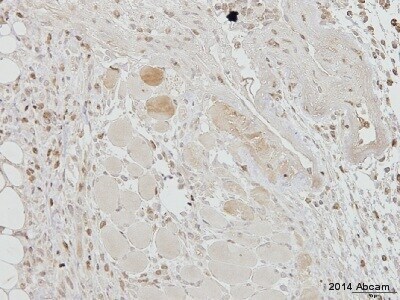 is your product „ Anti-Prostaglandin E2 antibody (ab2318)” available without azide as well? We unfortunately do not have the Anti-Prostaglandin E2 antibody (ab2318) available without sodium azide present. I hopethis information has been of help. If you have any further questions, please do not hesitate to contact us again. I have to confirm thatab2318 is not eligible for the testing programmewith different species. The target Prostaglandin E2 is not a protein but a lipid. This chemical will be the same independently of the species. 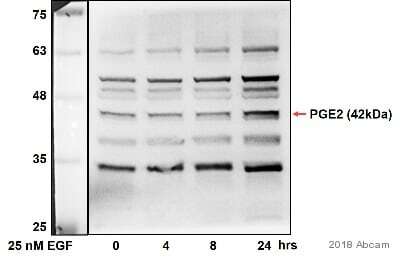 Your customer should not have any problems detecting Prostaglandin E2 in rabbit samples. Please keep in mind that since PGE2 is a lipid, extraction buffers containing detergents (for preparing tissue samples) are not recommended. Mechanical disruption in a buffer such as PBS is recommended instead. For serum and plasma, simple dilution should be sufficient. I hope this information is helpful and wish your customers good luck for their experiments.